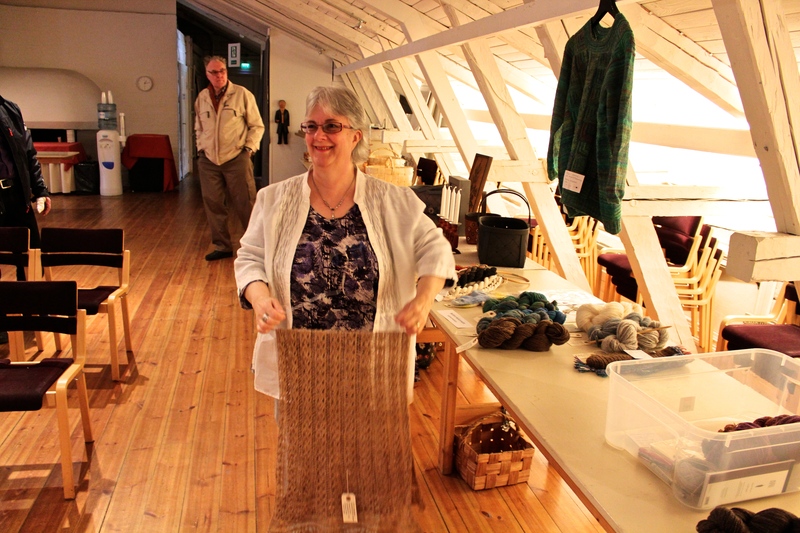 I received a fine award this week – I’m the crafter of the year 2016 at Stundars, the museum and craft centre where my guild Björken is active. 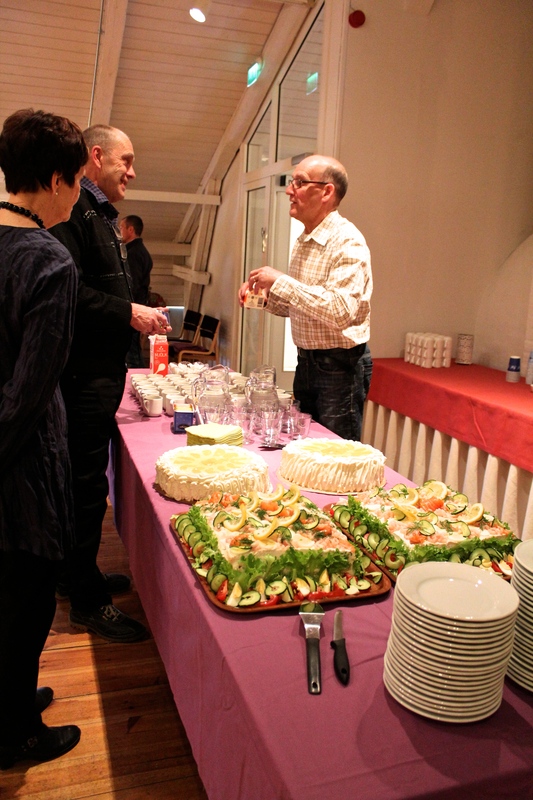 The award is called “Årets Gunnar”, “Gunnar of the Year”, after the museum’s founder Gunnar Rosenholm. I’m of course very proud and happy! Three of the diplomas on a wall in my spinning room are hand printed at Stundars’ printing museum. If I receive more diplomas I have to move the picture showing a part of the Bayeux tapestry… it’s been with me for decades, an inspiration for a handspinner to spin fine and even threads for making art. 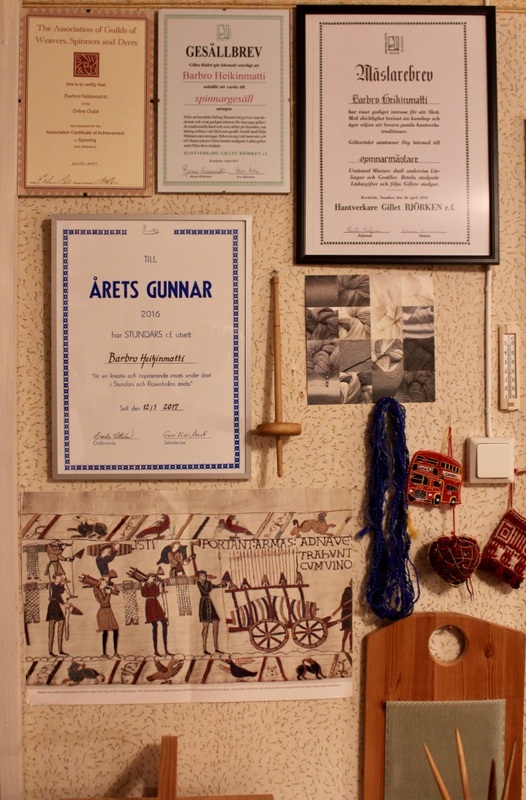 Left to right: Certificate of Achievement in Handspinning (Online Guild of Weavers Spinners and Dyers, UK) ; Gesällbrev, apprentice diploma (Stundars) ; Mästarbrev, master spinner diploma (Stundars) ; and the Crafter of the Year 2016 diploma. I got flowers, and I was interviewed in the local paper and radio station. Always nice to spread the word to a world that knows next to nothing about spinning! 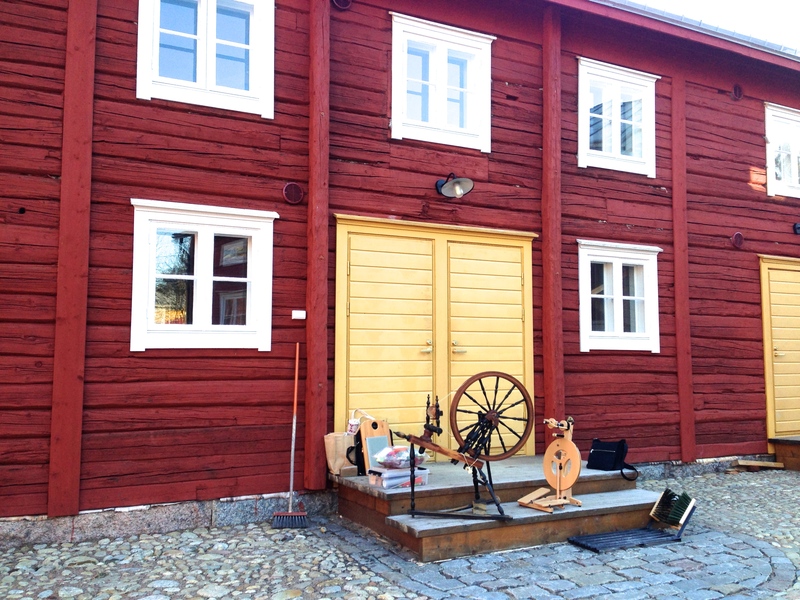 The outdoor museum and crafts centre Stundars, where I spin in public a few times every year, opened a couple of weeks ago. I love spinning in the old farm house, one of the almost 70 buildings on the grounds. 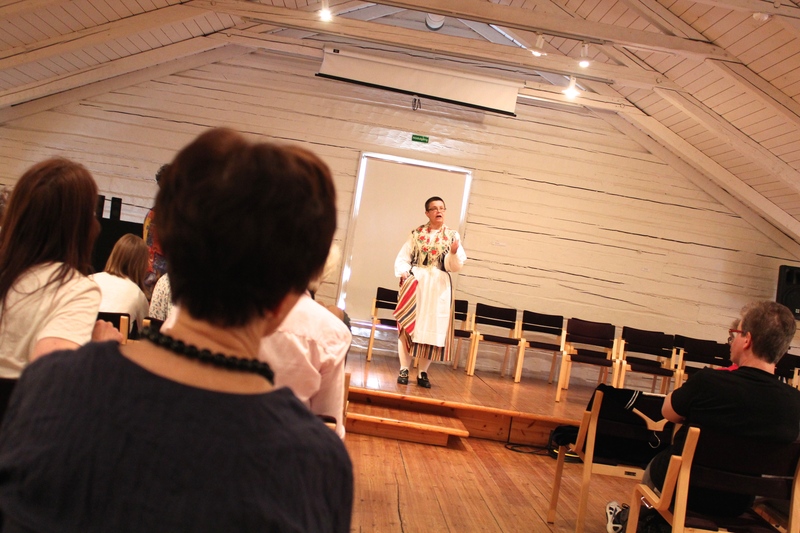 About 1500 school children, refugees, and senior citizens visited us during the three days the museum was open for groups in May. In June it’s open every day. This visitor wasn’t afraid to sit down by my wheel! She hadn’t spun for a long time, but proved what all spinners know: once you’ve learned to spin, you know how to do it. 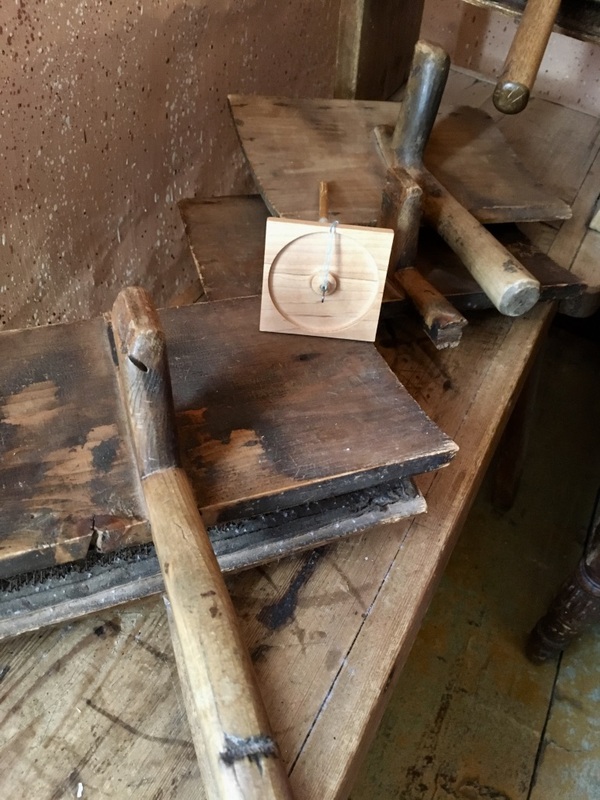 A distaff for flax strick I found in one of the rooms. Wish I had one of those! A small wooden box that must’ve been even more beautiful when new. The yellowish strips are straw. 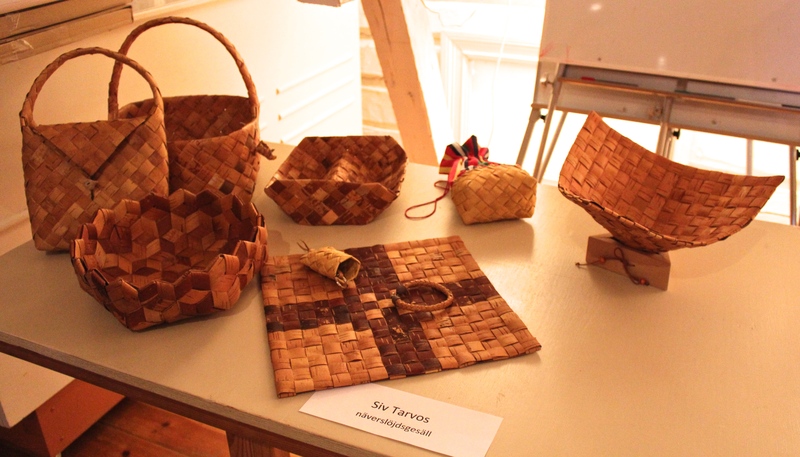 Straw seems to have been used for decoration in most parts of the world. Behind the box is a Bible, a book that could be found in every home. My two fellow crafters, the two bobbin lace ladies Ulrike and Vuokko, trying to warm themselves on the first day when the house was still cold and a bit damp after the winter. I was warm and happy, sitting by the fire. 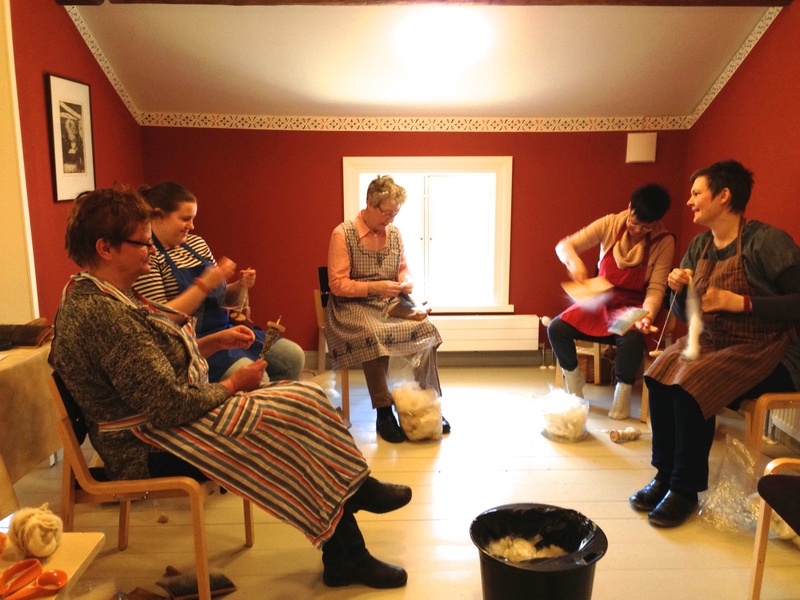 The spinning traditionally took place next to the fire, because here in Ostrobothnia the wool was seldom scoured. You needed to keep it warm for easier carding and spinning. With so many buildings there’s always repairs to make. There’s a whole small village behind the buildings in the photo: the “Grey Village”. Those who could afford it painted their houses red and white. In the Grey Village lived the poor: often crafters like blacksmiths, shoemakers, tailors, seamstresses, carpenters. There’s always a few easy crafts for the children to try. Here’s the rope maker waiting for the children to arrive. The gate way through the barn is typical for bigger farm houses here. It’s big enough for a horse and carriage. You could shut the door when needed. If shutting the gate door wasn’t shelter enough, you had your weapons close at hand in the farm house. The hunting weapon and the axes could be used also for defend. The mace is made especially for defend. The grim looking collar is for protecting the dog against wolves. There were good days, and there were bad days, as always. When I look at all the beautiful and clever things in our museums, I still have an impression that the good days were many. Maybe the mace was never used! I was invited to a blog hop around the world by mazzaus from Australia. Her blog Local & Bespoke is varied with great photos, and always interesting for someone who likes sewing, dyeing, spinning, silk worms. Thanks for inviting me, M! 1. What are you working on? I’m a spinner, but also a knitter, and occasionally I nalbind, weave bands on an inkle loom or cards, and I also sew. I’m quite fond of tapestry crochet! Right now I’m on “vacation”, which means I’m “resting” after a very intense spinning period that lasted for three and a half years. 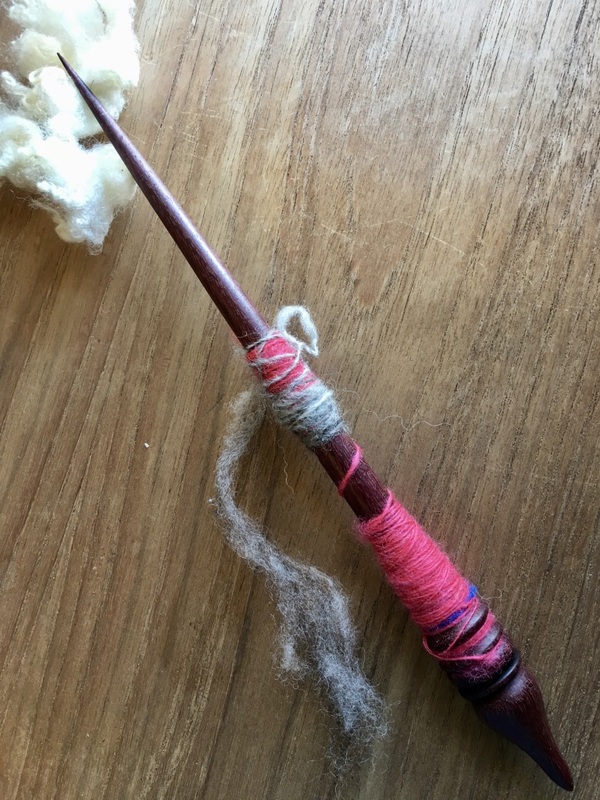 During that time I studied for the Certificate of Achievement in Handspinning in Online Guild, and the master spinner title in my local guild Björken at Stundars. 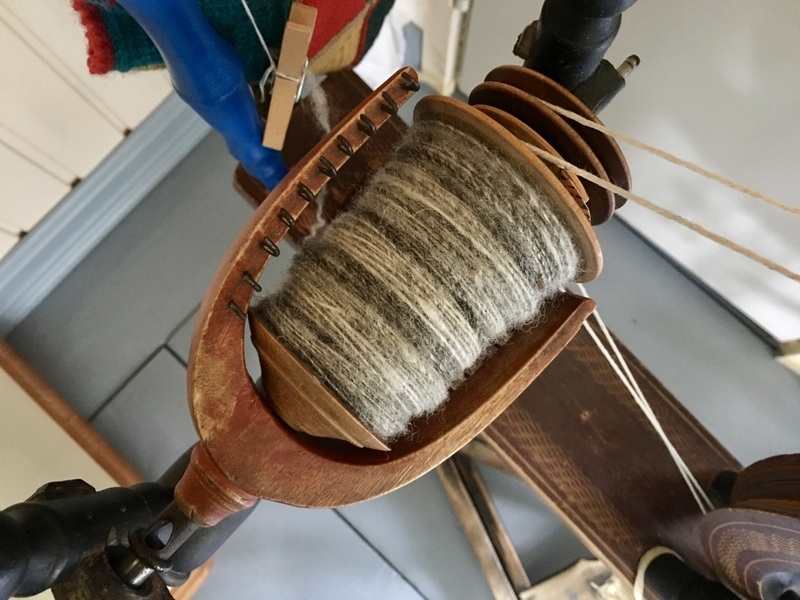 Now I prepare fleece for spinning, I spindle every now and then, sew clothes, knit, and try to figure out the secrets of card weaving and learn more about inkle weaving. I will continue my work with wools from six Northern Short Tailed sheep, a work I started when spinning for my master spinner title. 2. How does my work differ from others? This is a difficult question. I’m a quite ordinary spinner. I like spinning in the old ways, i.e. I don’t much care about spinning art yarns. I love looking at them and admire the skills of some of the spinners, though. I love spinning and textile history, but that’s not unusual either. For me spinning is much more than a hobby, even if I don’t spin for trade any more. I spun dog hair for customers for more than a decade. So, I don’t think my spinning differs from other spinners’ with the same interests as me. I spin many kinds of fibers, but mostly wool. I spin on supported spindles, top whorl spindles, I can spin on bottom whorls but prefer top, old wheels, new wheels, electric wheels. I prepare my fibers myself, or buy them readily prepared. 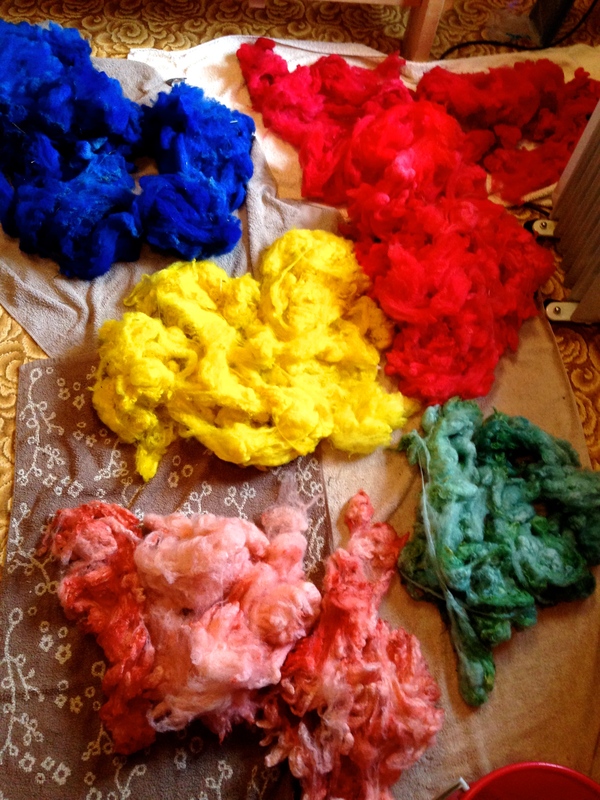 I sometimes dye both wool and yarns. But different? No. 3. Why do I create what I do? An urgent need! I have felt this need ever since the beginning of the 80s when I touched my first fleece. I became obsessed very quickly. Every day teaches me something new about fibers and yarns. 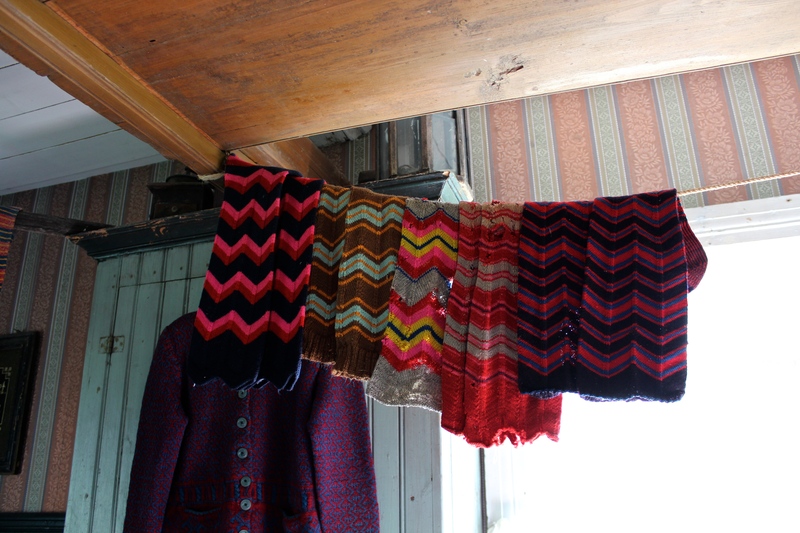 And now I hand over the baton to TexasRanger, who lives guess where… Have a look at her blog Deep in the Heart of Textiles! 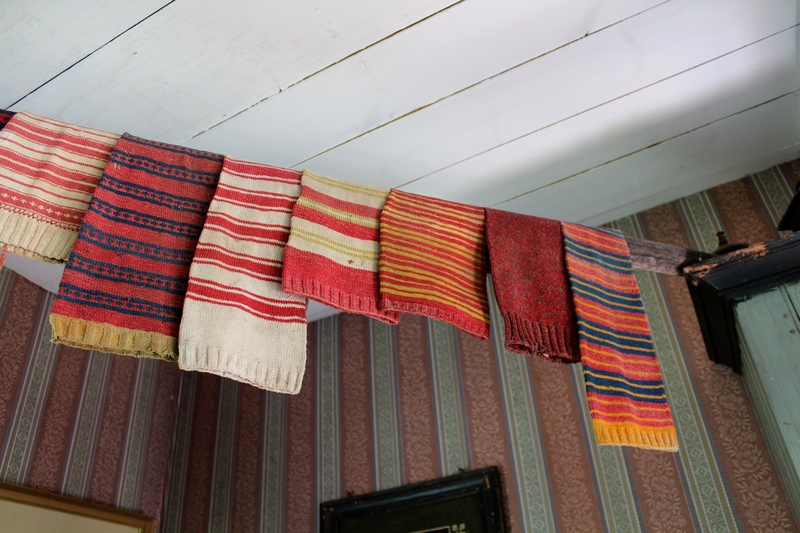 Like Mazzaus, TexasRanger takes beautiful photos, and she writes about many aspects of textiles. If you scroll down a bit you find her colour fastness test, which is quite interesting to me. I have a few natural coloured yarns sitting in a window since spring, waiting for me to see what the bright spring and summer sun has done to them. I have mentioned one of the small museums in my municipality many times. 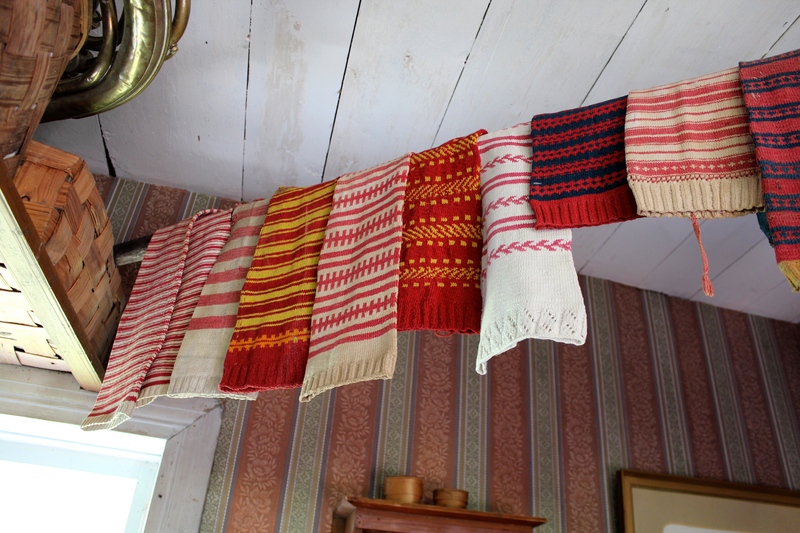 Myrbergsgården has more than 5000 textiles, mostly from the late 19th century until WWII. 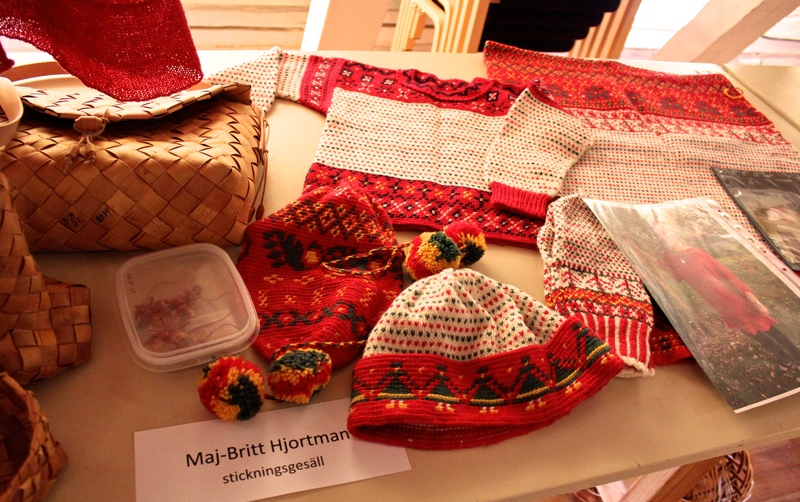 This summer they showed knitted and crocheted items, and yes, the Nordic Knitting Symposium visited the museum and I think most of the knitters loved what they saw. I’ll show mittens and caps in another post, and the Vörå sweater will also have a post of its own. Today we’ll have a look at socks. 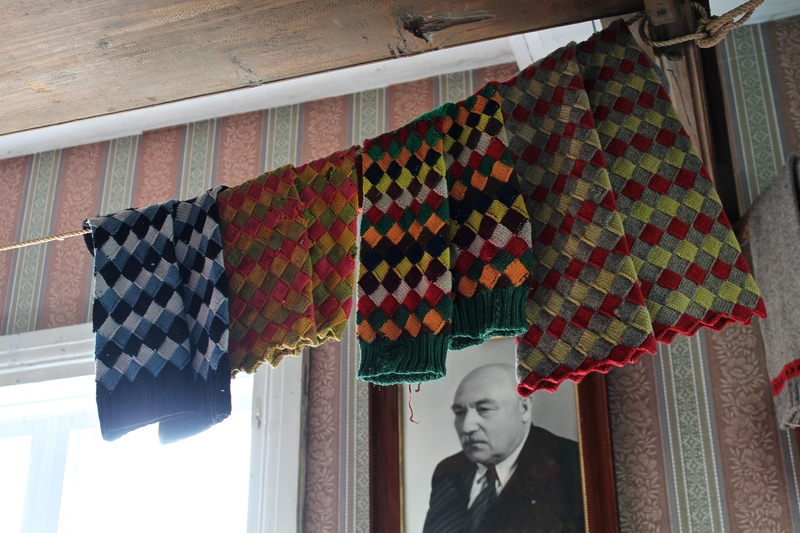 The socks from Myrbergsgården below are all knitted between 1880 and 1920. 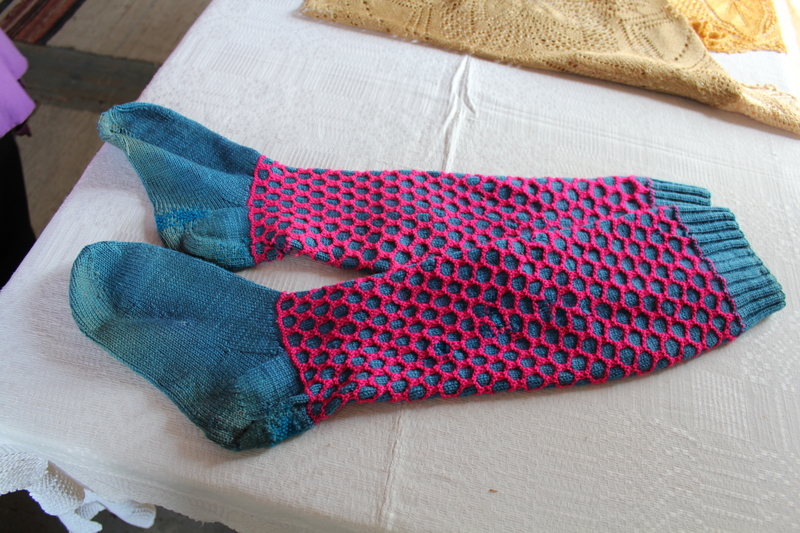 These socks were mostly knit by countrywomen who didn’t have written patterns. They borrowed a sock and tried to knit a similar one. 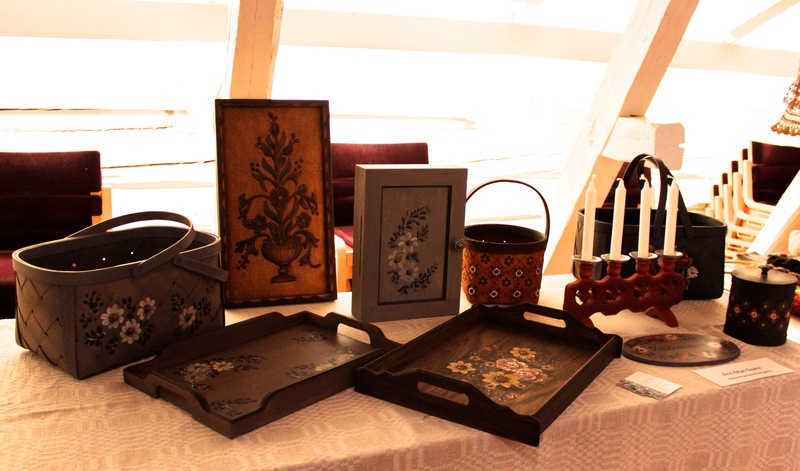 That’s the way we get varieties and new patterns, new versions of old designs. I love that way of knitting socks, and that’s how I do it most of the time, even if I sometimes use a written pattern also. I’m a dedicated sock knitter. 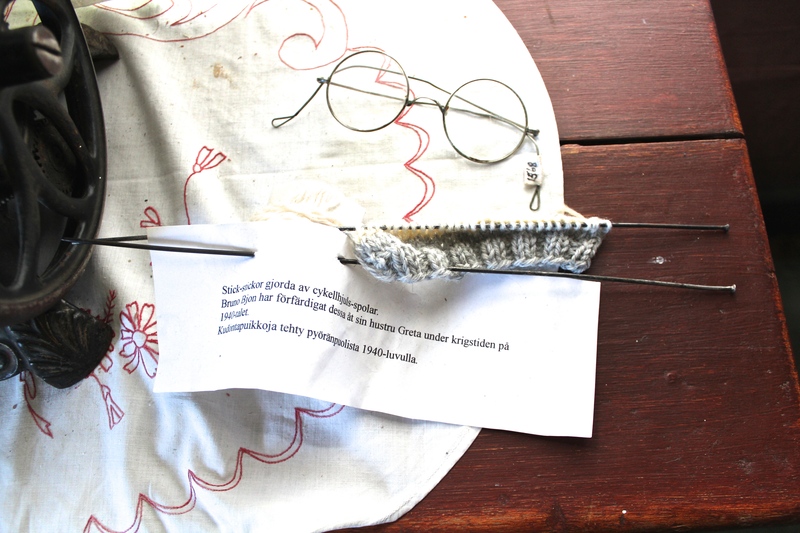 I have a sock (or two or three or four…) on the needles all the time. I don’t really need to knit socks, I could buy them if I wanted to. 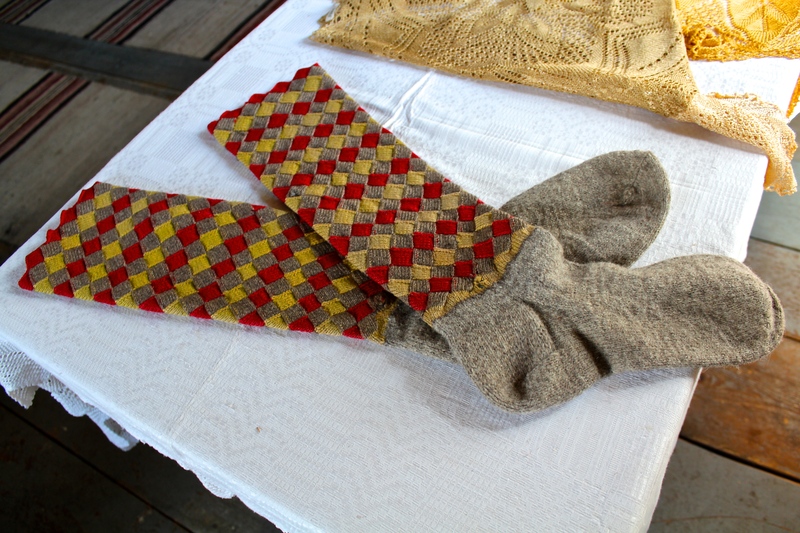 The foot was often knitted in plain grey or brown wool yarn. It was common that new foots where knitted when the old ones couldn’t be darned any more. 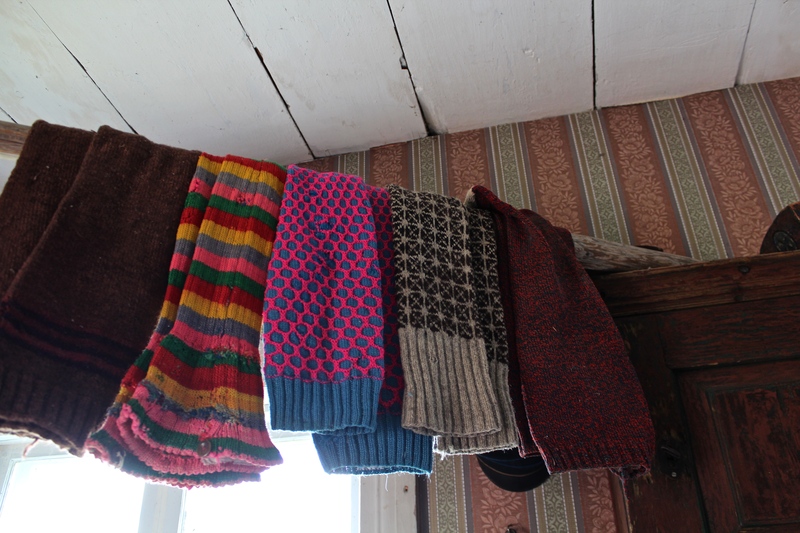 I don’t know what yarns all of these socks are made from, but I’m sure many of them are hand spun. 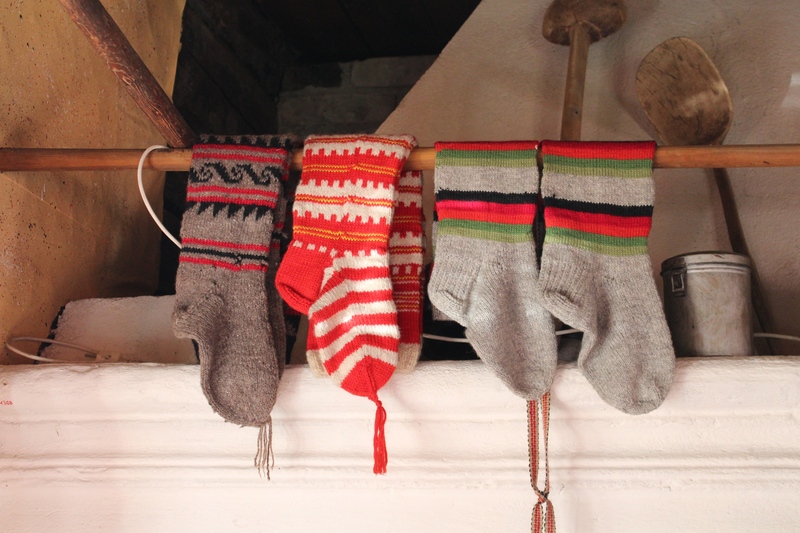 The bright white and red socks in the first photo are made from commercial cotton yarn. 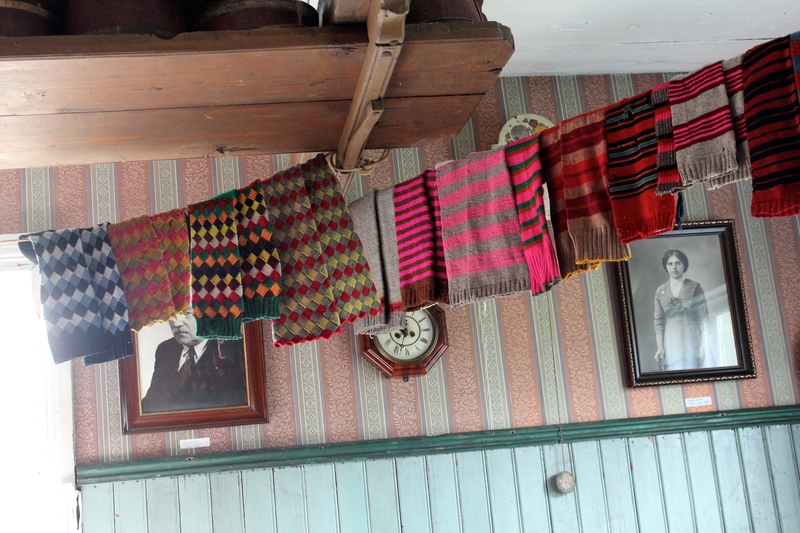 I’m quite amazed by the beautiful, skilled knitting in all socks shown in this post. I love the colours! You can see that anilin was popular at that time. 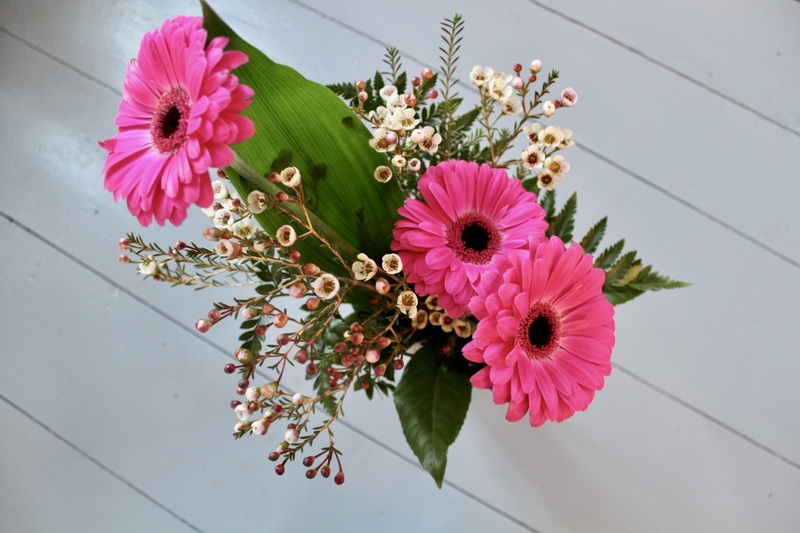 We do love pink, don’t we? I also love the clearly defined stripes. I think I’m going to abandon the self-striping yarns and go back to the old way of knitting. The honeycomb (I’m not sure what to call that stitch, please comment if you know!) combined with stranded knitting is very interesting. It was popular in some parts of Finland at that time. Have you tried entrelac in socks? I have, once, and I had to frog it. It’s not easy even if you have a well written pattern. 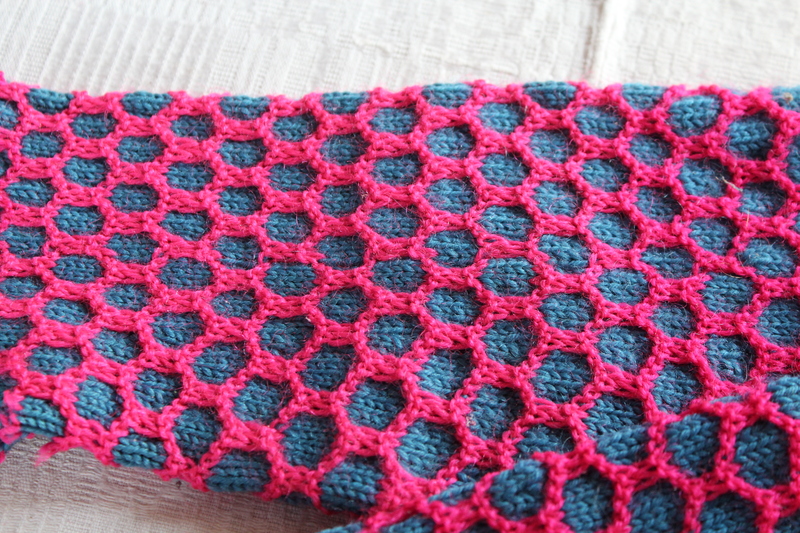 When the organisers of the Knitting Symposium first asked me to come and teach, they wanted me to teach entrelac socks. I said no. I’m not a very avid knitter, and the thought of teaching entrelac socks scared me. I will try to knit a pair once more to see if I can understand it better, because I sometimes use entrelac in sweaters and that doesn’t scare me at all. The sock in the close up has fewer stitches in the squares in the ankle part, the others seem to have the same amount in the upper part also. 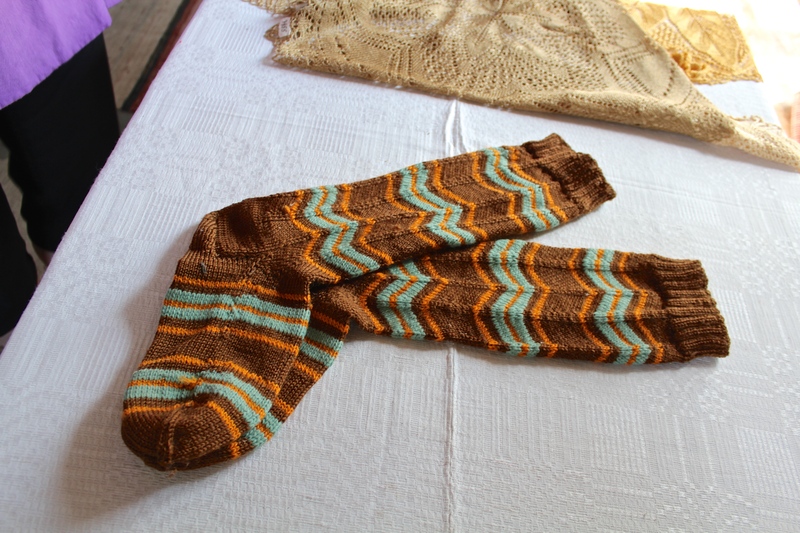 A few decades later, in the 1940s, Norwegian influence like star designs can be seen in Finnish socks. 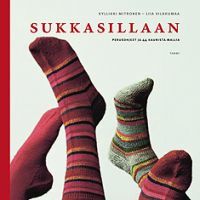 Later still, in the midst of the western world’s boom of self-striping yarns, lace and intricate cables, a thorough book on plain socks was published in Finnish in 2009. It’s called Sukkasillaan (“sock-footed”), and I’d be surprised if it won’t become a classic. 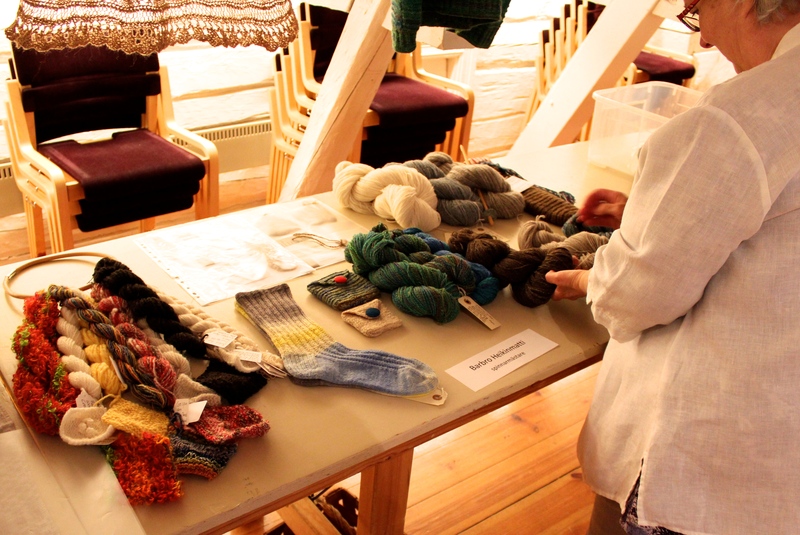 If you know the basics of sock knitting, it’s easy to be as creative as the women who knitted the socks in Myrbergsgården and Stundars. I går fick jag mitt spinnarmästarbrev, överräckt av de två åldermännen i mitt gille Björken. Det siktade jag till redan före jag avlade mitt certifikat i Online Guild förra sommaren. I många år har jag följt mästarna på Stundars och tänkt att en dag ska jag också vara mästare! Deras lugna och säkra utstrålning vid sitt hantverk har imponerat djupt på mig. Tidigt insåg jag att ska jag bli som de så måste jag jobba hårt. Och det har jag gjort. Jag spann mycket för certifikatet, och månaderna efter det spann jag minst lika mycket, i princip åtta timmar varje dag. Resten av tiden gick till läsning av spinnlitteratur, diskussionsforum, videor. En underbar tid, en krävande tid. Yesterday I received my diploma in handspinning, presented by the two aldermen in my guild Björken. I was aiming for this already before starting to work on my Certificate in Handspinning in Online Guild, which I achieved last August. For many years I have admired the masters at Stundars, and thought that one day I will be a master craftsman too! Their calm and confident karisma while working with their crafts has made a deep impression on me. Vey early I realised that if I want to be like them I’ll have to work hard. And that I have done. I spun a lot for the Certificate, and the months after I spun at least as much. I spun for eight hours every day. The rest of the time I spent reading about spinning, talking and reading in forums on internet, I watched videos. A wonderful time, a demanding time. Glömde jag att ta ordentliga foton av min egen avdelning? Ja det gjorde jag. 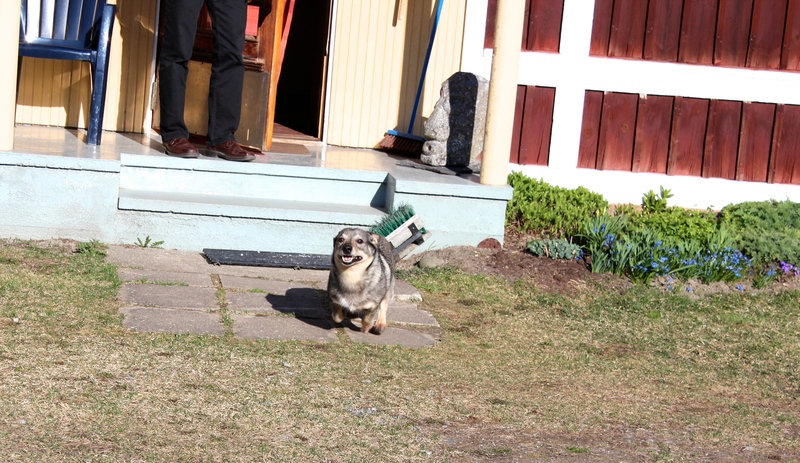 Min man som också fotograferade trodde att jag redan hade bra foton av mina egna saker så han tog inga han heller. Därför får ni se mig i stället. 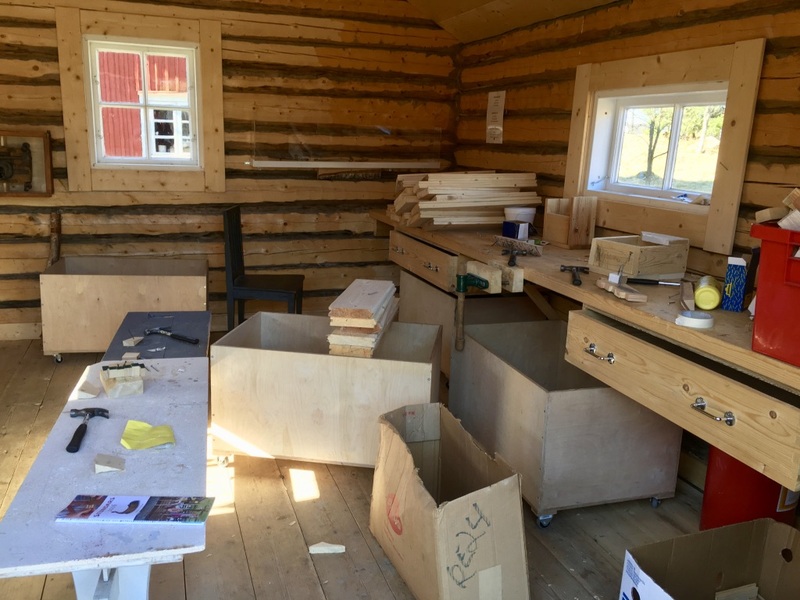 Jag håller en sjal av alpacka, kamelhår och silke som jag just ska hänga upp bredvid min tröja som redan hänger där. På det andra fotot ser man bordet jag håller på att arrangera. De flesta av garnerna har jag redan visat här i bloggen tidigare. Tröjan och sockorna ska jag visa i ett annat blogginlägg. Did I forget to take proper photos of my own exhibition? Yes I did. My husband who also took photos believed I’d taken photos of my own items, so he didn’t take any. That’s why you have to look at me instead. I’m holding a shawl from alpaca, camel and silk that I’m going to hang beside my sweater already hanging there. The second photo shows me arranging the table. I have showed most of the yarns on the blog earlier. I will show the sweater and the socks in another blog post. Hedersålderman Bjarne Hammarström och ålderman Krister Vidgren kallar den första gesällen till podiet. De fem nya mästarna Ann-Mari Svahn, Roger Sandelin, Barbro Heikinmatti, Anders Enlund, Anna-Lena Björkman har fått sina mästarbrev. 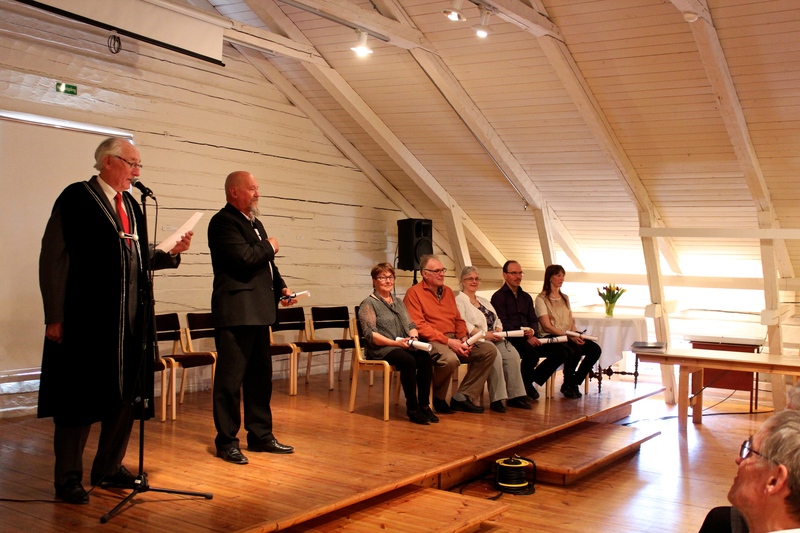 – Honorary alderman Bjarne Hammarström and alderman Krister Vidgren addressing the first new journeyman to come to the podium. The five new masters Ann-Mari Svahn, Roger Sandelin, Barbro Heikinmatti, Anders Enlund, Anna-Lena Björkman have received their diplomas. En del gesäller har redan uppnått så stor skicklighet i sina hantverk att de nog nått mästarnivå. Jag visar ett par av dem. Some of the journeymen have achieved such skills that they could almost be called masters. I show two of them. Jag vill också visa ett exempel på en gesälls stora skicklighet i knyppling. Tyvärr har jag inget namn på henne. TILLÄGG: nu har jag ett namn tack vare Mari: knypplerskan heter Ulrike Björkqvist. 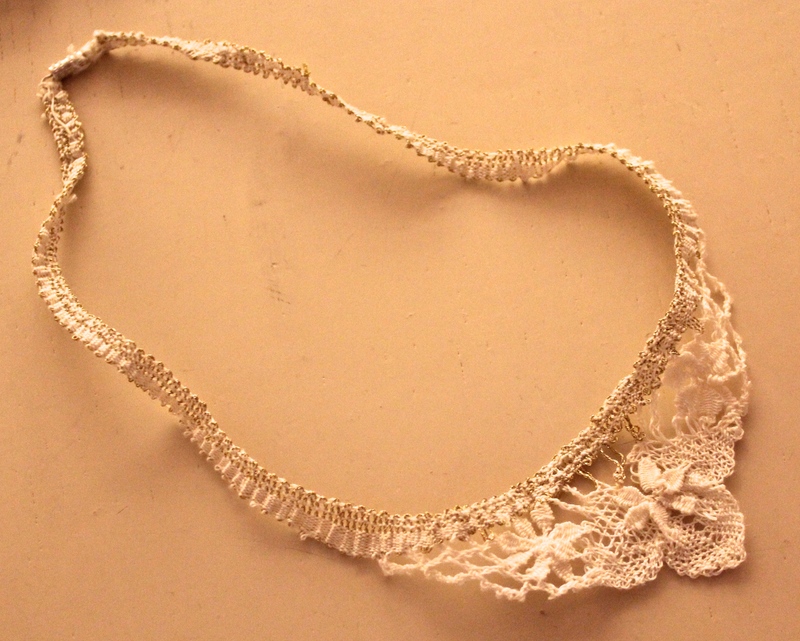 – I also want to show a necklace made by a very skilled bobbin lace journeyman. Unfortunately I don’t remember her name. 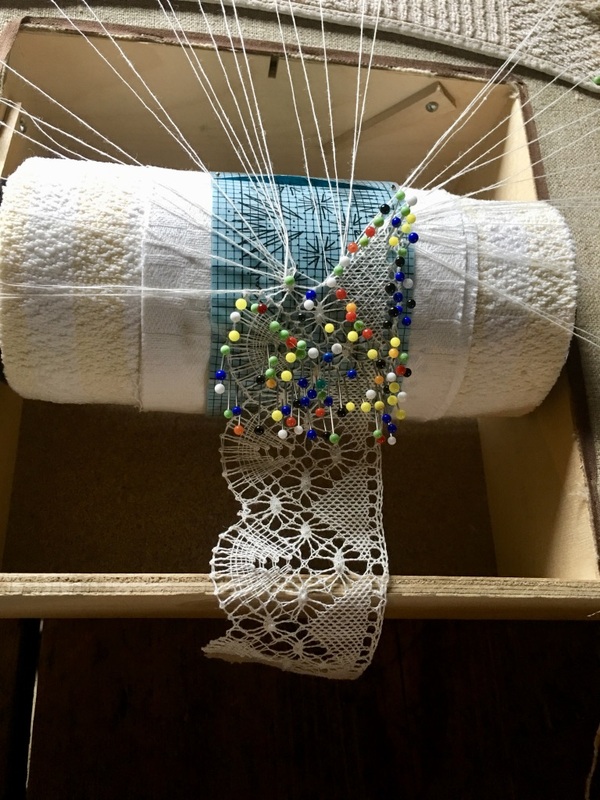 ETA: I now have a name thanks to Mari: the bobbin lace crafter is Ulrike Björkqvist. Andra nya och även de mycket skickliga visade virkning, smide, garvning, kopparsmide, och en glädjande nyhet för alla oss som fick höra henne: Neppe Pettersson är gillets första berättargesäll. 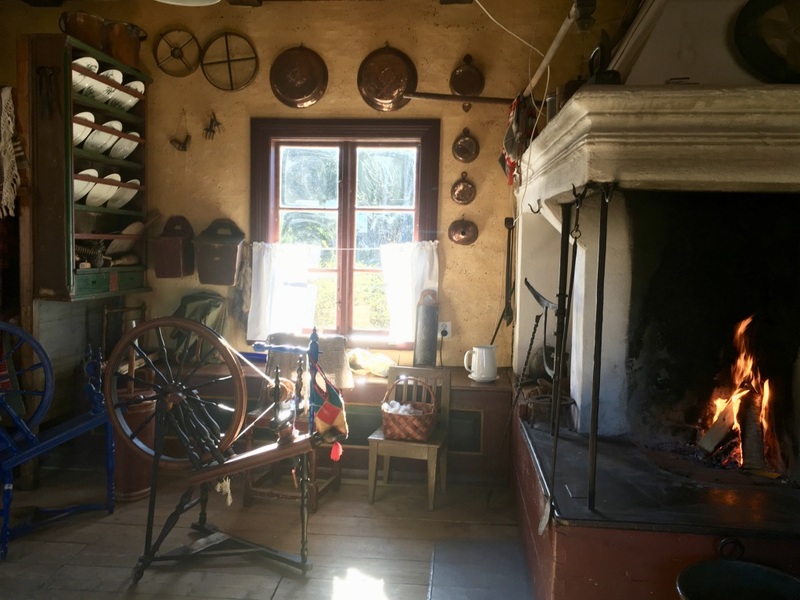 – Other new and also very skilled journeymen showed crochet, smithery, tannery, copper smithery, and a new skill that was very enjoyable to us who could listen to her at the event: Neppe Pettersson is the guild’s first journeyman in story telling. 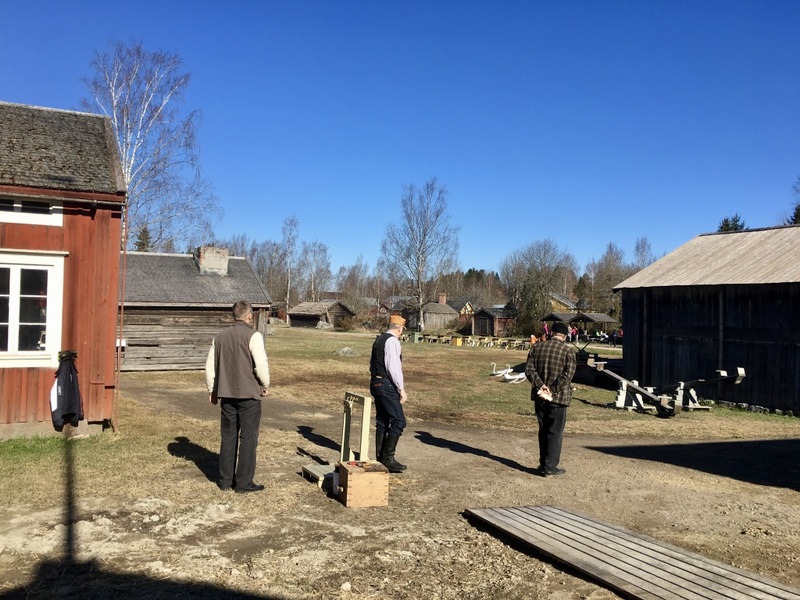 Gillets mästerspelman Kalle Berg spelade en gånglåt för alla gesäller som nu ska ut och vandra i jakt på en mästare som kan lära dem deras yrke. 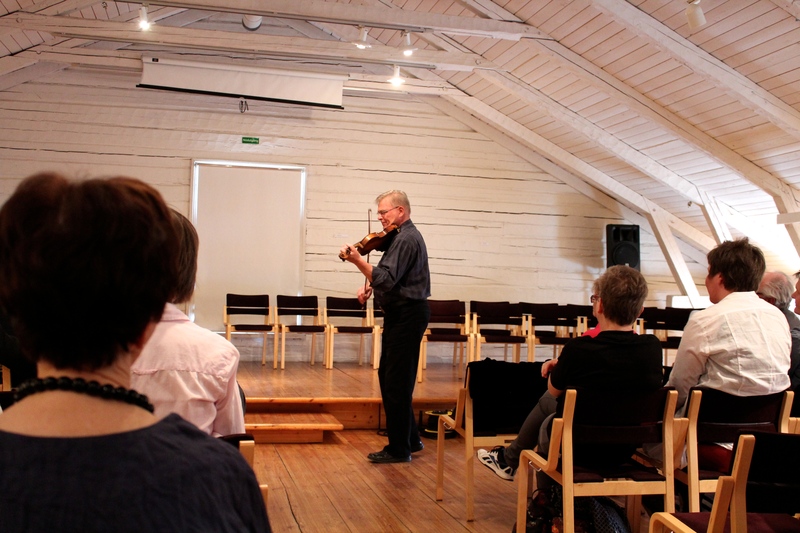 – The Guild’s master fiddler Kalle Berg played a marching tune for the journeymen that now have to walk out into the world to find a master who can teach them their trade. Selma spelade klarinett med bravur. På somrarna kan man se henne här och var på Stundars, hela tiden igång med nåt hantverk. 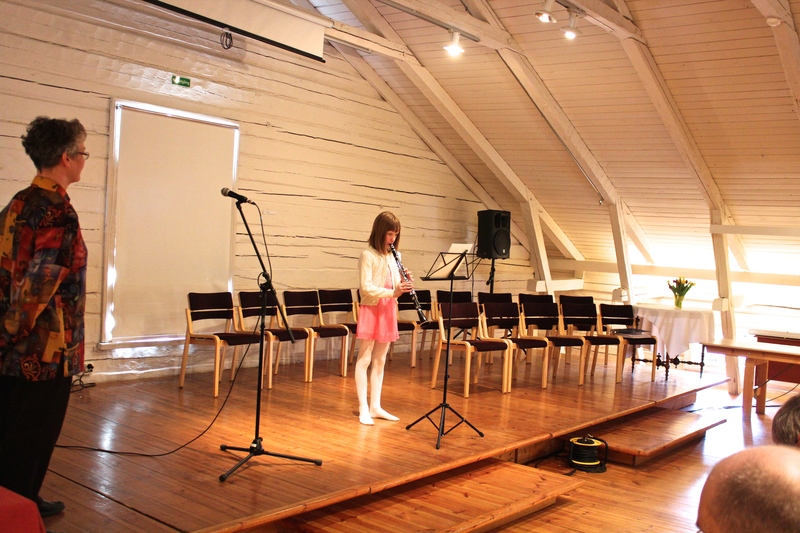 Valet av ett så svårt instrument förvånar mig inte det minsta – Selma played the clarinet with skill. In the summers you can se her at Stundars, doing something crafty the whole day. I’m not surprised she’s chosen one of the most difficult instruments there is. Jag hoppas jag kunnat förmedla något av Stundars hantverkares mångsidighet och skicklighet. Det finns många skäl att besöka museet under hantverksdagarna. En väldigt bra sådan är Stundars egna bagarmästare Mikael Eriksson, som naturligtvis stod för trakteringen också denna fina dag. 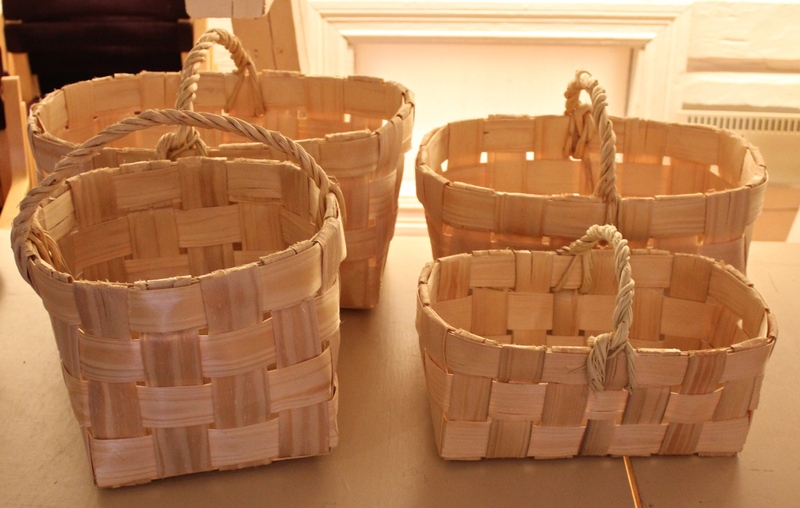 I hope I have been able to show some of the great skills of the crafters at Stundars. 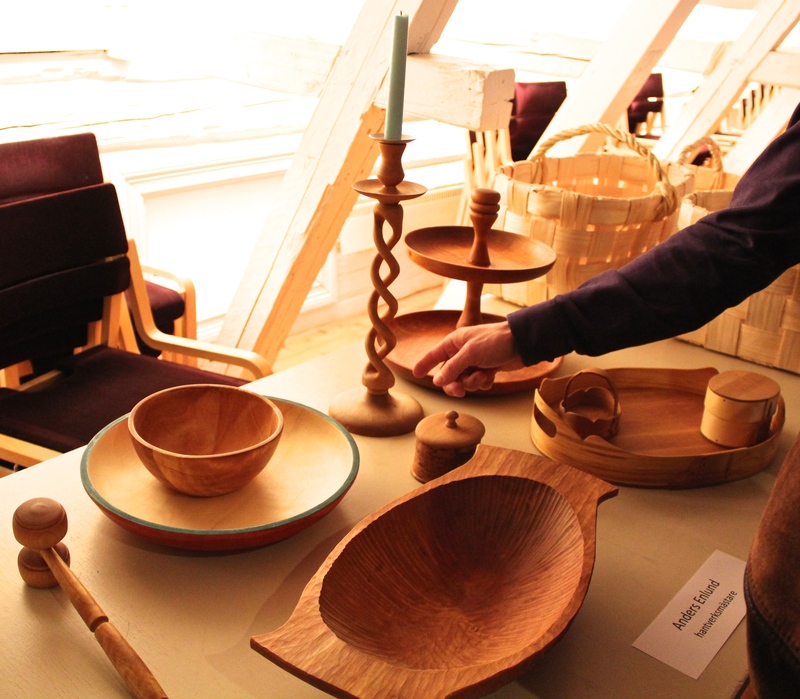 There are many reasons to visit the museum during the craft events. 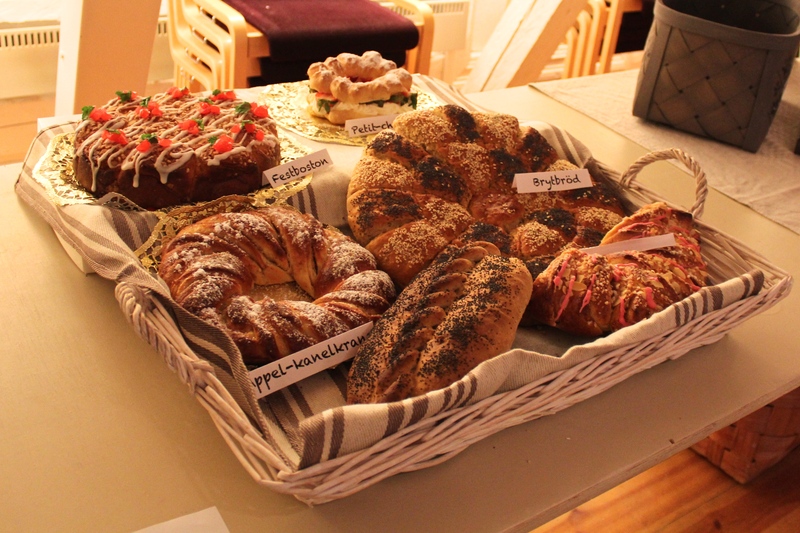 One very good reason is Stundars’ own master baker Mikael Eriksson, who naturally stood for the catering during this fine day. Och vem var lycklig när vi kom hem? And who was happy when we came home?